Please carefully read the terms and conditions ("Terms and Conditions") below before placing any order for any of the Goods or Services from http://www.food.jumia.rw. By placing an order for any of the Goods or Services from this Website, whereas it is by phone, through our mobile applications or by any other available channel, you agree to be bound by these Terms and Conditions. Section 1: jumia food Introduction We are jumia food, a brand of http://www.food.jumia.rw, unless otherwise stated. 2.9. "Website" is a reference to our Website http://www.food.jumia.rw, our mobile applications or any other platform we will choose to offer our Goods or services. 3.2. In case you chose to pay with a debit or credit card you warrant that you are the legal holder of the card and the funds backing it. You should also warrant that you have sufficient funds to make the payment. 3.3. Any Goods and Services or Food Delivery which you might buy from this Website are intended for your use only. Resale of any of such Goods and Services or Food Delivery or acting as an agent for a third party is forbidden under this agreement. Only when acting as a principal you should contract the Services. 3.4. Please note that some of our Goods may not be suitable for certain age ranges. Please make it sure, by carefully reading product descriptions, that the product or products you order suits the recipients age. 3.5. When ordering from this Website you may be required to provide an e-mail address and password. You must ensure that you keep the combination of these details secure and do not provide this information to a third party. 3.6. Any order that you place in our website or related platforms is subject to availability, delivery capacity and acceptance both by us and the Partner restaurant. Once you place an order online, we will send you an email to confirm that we have received it. This email confirmation will be produced automatically and will just give you confirmation of your order details so that you can check that all details are correct. The fact that you receive an automatic confirmation does not necessarily mean that either we or the Partner restaurant will be able to fill your order. Once we have sent the confirmation email we will check availability and delivery capacity. 3.7. 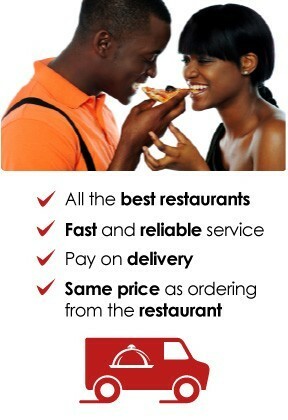 If the Partner Restaurant you chose to order Food Delivery from accepts the contract it will confirm it to jumia food. If the details of the order are correct, the contract will be confirmed by text message (SMS). 3.8. In the case that Goods offered by jumia food were ordered, jumia food will confirm availability together with or separately from the partner restaurant. 3.9. The confirmation message will specify delivery details including the approximate delivery time specified by the Partner restaurant and confirm the price of the Food Delivery, Goods and Services ordered. 4.1. Any contract for the supply of Food Delivery from this Website is between you and the Partner restaurant; for the supply of Goods or Services from this Website any contact is between you and jumia food. You agree to take particular care when providing us with your details and warrant that these details are accurate and complete at the time of ordering. You also warrant that the credit or debit card details that you provide are for your own credit or debit card and that you have sufficient funds to make the payment. 4.3. All prices listed on the Website for Food Delivery by the Partner restaurant or a delivery partner listed on the Website reflect the price the Partner restaurant or the third party provider charges at the time of listing. We give great care to keep them up to date. In case the price listed is not current and the restaurant informs us immediately after placing the order, we will contact you to inform you about the price difference and you can choose to opt-out of the order. 4.4. All prices listed on the Website for Goods and Services by jumia food reflect the price at the time of listing. We give great care to keep them up to date. In the case the price listed is not current, we will contact you to inform you about the price difference and you can choose to opt-out of the order. 4.5. All prices for delivery by jumia food or a third party provider assigned by jumia food listed on the Website are correct at the time of publication, however, we reserve the right to alter these in the future. 5.1. Delivery periods at the time of ordering should be taken into account as approximate only and thus they might vary. Goods will be sent to the delivery address you stated when placing the order. 5.2. If delivery is done by the Partner restaurant jumia food cannot be held responsible for any untimely delivery. This will be the the Partner restaurant sole responsibility. 5.3. In the case delivery is done by jumia food or a third party delivery partner assigned by jumia food, we will make our best effort to deliver in a timely manner. Still, we take no responsibility for late delivery. 5.4. In any of two cases above, all orders will be always delivered by a reputable courier. If the Goods are not delivered within the estimated delivery time quoted by us, please contact the partner restaurant first. You may also contact us by telephone or email and we will try to ensure that you receive your order as quickly as possible. 5.5. In case of a late delivery, the delivery charge will neither be voided nor refunded by jumia food. 6.1. You must notify the participating restaurant immediately if you decide to cancel your order, preferably by phone, and quote your order number. If the restaurant accepts your cancellation, no cancellation fee applies. If the restaurant refuses cancellation, e.g. because preparation of Food Delivery has been completed and/or delivery personnel has already been dispatched, it may not be cancelled. Notwithstanding the foregoing, in case you paid for your order online, you should only contact jumia food with respect to a refund of your payment. You can always contact jumia food with any complaint or concern you may have with respect to an order for which you paid online. 6.4. In the unlikely event that the Partner restaurant delivers a wrong item, you have the right to reject the delivery of the wrong item and you shall be fully refunded for the missing item. If the Partner restaurant can only do a partial delivery (a few items might be not available), its staff should inform you or propose a replacement for missing items. You have the right to refuse a partial order before delivery and get a refund. We are not responsible for wrong or partial delivery. The issue has to be settled directly with the Partner restaurant. 10.1. Great care has been taken to ensure that the information available on this website is correct and error free. If it came to occur, we apologize for any errors or omissions that we might publish in ur website. We cannot warrant that use of the Website will be error free or fit for purpose. We will ake our best to correct such errors in a timely and effective manner.Also,Neither can we warrant that the site or the server that makes it available are free of viruses or bugs or represents the full functionality, accuracy, reliability of the Website and we do not make any warranty whatsoever, whether express or implied, relating to fitness for purpose, or accuracy. 10.6. If we have contracted to provide identical or similar order to more than one ustomer and are prevented from fully meeting our obligations to you by reason of an Event of Force Majeure, we may decide at our absolute discretion which orders we will fill and to what extent. 10.10. Offers are subject to jumia food's discretion and may be withdrawn at any time and without notice. 11.1. All prices are in Rwanda Francs. 11.2. We may subcontract any part or parts of the Services or Goods that we provide to you from time to time and we may assign part or parts of our rights under these T&Cs without your consent or any requirement to notify you. 11.9. These Terms and Conditions and our Agreement shall be governed by and construed in accordance with the laws of Rwanda. The parties hereto submit to the exclusive jurisdiction of the courts of Rwanda. 11.11. These Terms and Conditions and a contract (and all non-contractual obligations arising out of or connected to them) shall be governed and construed in accordance with Rwanda Laws. Both we and you hereby submit to the non-exclusive jurisdiction of the Rwanda Courts. All dealings, correspondence and contacts between us shall be made or conducted in the English language.